I remember the night clearly. It must have been the worst night of my life. It was 5 days before my 15th birthday in January and I was playing in a basketball game for my high school's team. We were playing one of those rough teams who didn't have a lot of talent but were very aggressive and had a lot of attitude. The game was almost over and this one girl from the opposite team and I were playing very rough on each other. We knew we were going to win due to the fact we were up by 20 with 3 minutes to go. The opposing team shot the ball and I jumped for the rebound then I was completely rammed and knocked to the ground by that one girl. I came down on my knee and heard the loudest crack. The pain was unbearable. They stopped the game, called an ambulance and I was rushed out of the gym on a stretcher to the nearby hospital. A few days later I found out I tore my ACL, my meniscus, and sprained my MCL. 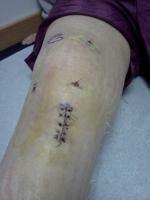 I had my first surgery in February to reconstruct my ACL. My doctor said I would be fine but physical therapy was brutal. After the surgery my body produced so much scar tissue I had to have another surgery in March to remove it. After the scar tissue removal I thought everything would get easier but my knee still would not bend after 2 months. I had physical therapy everyday but nothing would make my knee bend more than 70 degrees. I had to have a 3rd surgery in May to force my knee to bend. It is now the end of June and my knee is only at 115 degrees. I've been going to physical therapy since January and I just wish none of this ever happened. I'd like to play volleyball in September but I am just hoping I can play basketball again. I have yet to achieve that goal.